This is a review of Sonoma wax melts from Kohl's for Spring 2019. 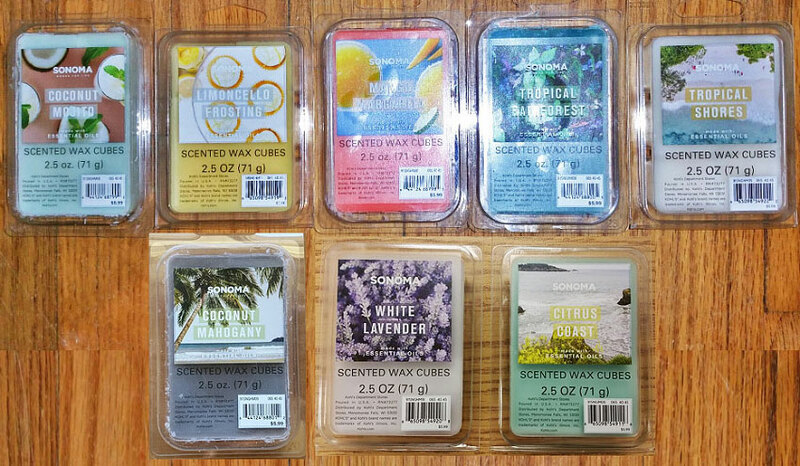 All but 5 of the Kohl's (Sonoma) Spring 2019 wax melts are scents that came out January 2018. This text review includes 3 additional scents that were not available when I did the video review: Citrus Coast, Mahogany Coconut, and White Lavender. This is a new scent. It's a savory grapefruit scent, like grapefruit with some herbs mixed in. It's not sweet at all. Looking at the notes, mandarin is orange and I don't smell orange at all. And hibiscus is a floral, which I also don't detect at all. I'm not a fan of this one as I prefer citrus scents that have at least a bit of sweetness. This is a new scent, and it's true to its name, and it smells great! On cold sniff it's a rich, sweet, warm cologne scent with a mahogany note (which has a tobacco, slightly incensey, slightly patchouli note with a smidgen of a woodsy note). But I also smell a hint of sweet coconut with a subtle salty note. But melted, it smells like a super sweet coconut candy, without any woodsy notes, and maybe just a smidgen of the cologne note. I really like this scent! A super sweet (almost nauseatingly so) coconut scent with a slightly salty lime note and maybe another fruit. It's much sweeter than other similar scents, but it smells fantastic. Looking at the scent notes, the tanginess is the lemon, although I can't actually pick that note out on its own. I don't know if this is the same Coconut Mojito scent that came out last year. The notes for that scent were coconut, strawberries and mint, but I described the scent the same way, although I recall that I didn't care for the scent. This is a new scent. It's a standard lemon bakery scent that smells like a lot of other lemon bakery scents out there. But that doesn't mean it's not fantastic, because it is! Although like most similar scent, it's not an authentic scent, more like lemony Fruit Loops cereal! It's very similar to (if not the same as) the beloved Tuscany Lemon Sugar Cookie scent. And it's slightly more lemony and slightly less sweet than ScentSationals Iced Lemon Sugar Cookies (I like the Sonoma scent more). This scent returned from last year, although I think it was also available a year or two before that. I smell mostly grapefruit, with an orange note and possibly a hint of zesty lemon. It's a nice fresh thirst-quenching summer scent. This scent returned from last year. It's a very nice fresh, watery men's cologne scent with maybe a hint of wood and a smidgen of coconut. Looking at the notes, I don't smell citrus at all. I think this is a new scent. It smells like a combination of salty lemon and coconut, but it's not a foodie scent because it also has a bit of a perfumey note (although it's not a perfumey scent, and it's not even very sweet). There may be a hint of wood way in the background. I like it! This is a new scent. I smell a hint of lavender and the alcoholic note of men's cologne. But it has only a hint of sweetness, so not nearly sweet enough to be a cologne scent. The lavender has a bit of a waxy note. And there's a smidgen of a garden herb note that gives this a very slight savory note. Looking at the notes, I guess it's the water mint, although this doesn't have a minty note. I don't care for this scent. Also returning from last year are Watermelon Sangria, Tahitian Pineapple, and Blue Hawaiian. And maybe a couple of others. I didn't buy them again this year because I didn't care for them.